The “Senorita Fiesta del Sol” was crowned on Saturday at the annual pageant hosted by the Fiesta del Sol planning committee. 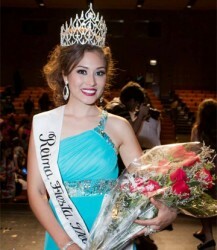 Erica Valdez, a DePaul University student, was crowned “Senorita Fiesta del Sol.” The winner becomes an active member of the Pilsen Neighbors Community Council. However, the pageant strives to help contestants develop and create positive change in their community.